Drive by your local booming suburban church, or the up and coming congregation everyone’s talking about in your community. You might find a state-of-the-art children’s complex–complete with antibiotic soap dispensers on every corner. You might find a Family Life Center–previously known as a gym–with a basketball court, foosball tables, maybe even an Olympic size pool. You’ll almost certainly find a feeding hall, perhaps with a franchised gourmet coffee kiosk nearby. What you will not find is a graveyard. Not many churches have cemeteries anymore. In some ways, that’s a good thing. Churches that are growing and evangelistic rightly conclude that sharing the Gospel with the living is more important than remembering the dead. But, still. I wonder if we are losing something by outsourcing the care of our dead to the funeral industry. Did we lose something important, maybe even something biblical, when we paved over our graveyards? The church graveyard might serve to remind us of something that we as contemporary evangelical Christians, with all our flash and verve, seem to forget too often these days. We are going to die. Too often we seek reminders of God’s power in the buzz and energy of a campus Bible study or a youth rally or a celebrated church service. We believe that God is present among us if there are beautiful, vital young people around us. We believe there is dynamism present if our services are seamless, and if our celebrities smile or cry on cue. And, often, the Spirit is there with power. But sometimes the excitement is just that: excitement–not the longing of a people for a crucified Messiah. Perhaps, though, a graveyard in our peripheral vision as we get out of the car for worship might remind us of the gravity of the task before us. 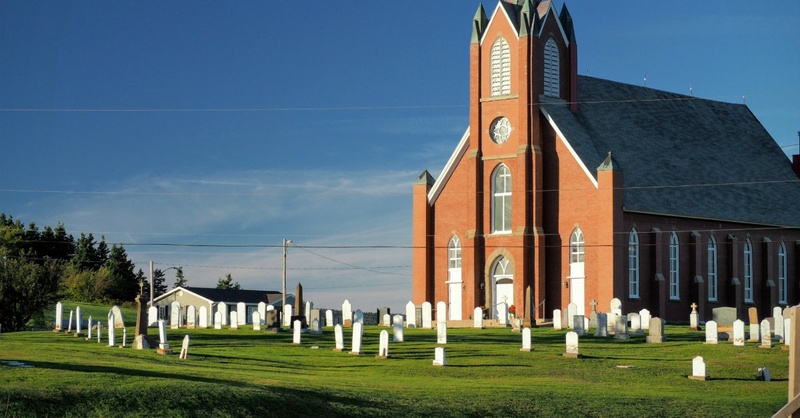 Maybe a cemetery in at least some of our churches would serve as an icon that all our Babels will collapse, all our wood, hay, and stubble will be incinerated before the Judgment Seat. After all, our church buildings–even the most state-of-the-art of them–will someday collapse beneath the weight of decay. Your church sign may someday hang silently above some rubble, battered and torn, like the Statue of Liberty in the final scene of the “Planet of the Apes.” Maybe the tattered wording on it will still announce to the silences around it, “The Church Alive Is Worth the Drive,” but no one will care about how good its sound system used to be. Our hymnals and our bulletins and our PowerPoint presentations and our systematic theology texts will one day wither away into mold and dust. The Library of Congress itself, with the record of all our best-selling evangelical Bible-studies and praise song recordings, will be swept away like refuse. The vocal cords we once celebrated from celebrity preachers and singers will one day vibrate no more, and the skin photographed for book covers and publicity shots will one day melt away into dirt. Only the Gospel, only the power of Christ, will remain. The church graveyard also reminds us that we are a peculiar people. When we are gathered together to our fathers, we don’t simply lie under the funeral home tent in Shady Grove #5 with all the others in the region of the last place to which we moved. We are laid to rest by our brothers and sisters, those who wait with us for Something to happen. I still ponder how much more effective we would be in preaching the Gospel to our neighbors if we showed them–even with our landscape around us that we are more than a community group. We’re a Kingdom–a Kingdom that spans the ages and includes the dead and the unborn, mighty as an army with banners. Now I’m realistic enough to know that the church graveyard is a thing of the past. We probably won’t see seminars on how to plan for a really good cemetery at any pastor’s conferences in our lifetime. But maybe we would see something of what we’re missing if we took some time to actually walk among the tombstones every once in a while. They are silent now. But they will sing again. They will preach again. They will testify again.